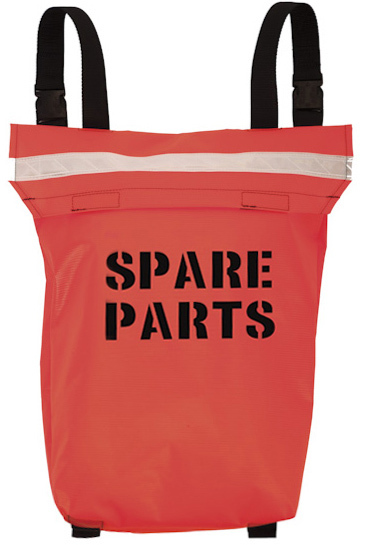 CAB High Visibility Bags and Covers feature strong, heavy duty construction. They provide added safety and protection for contents. 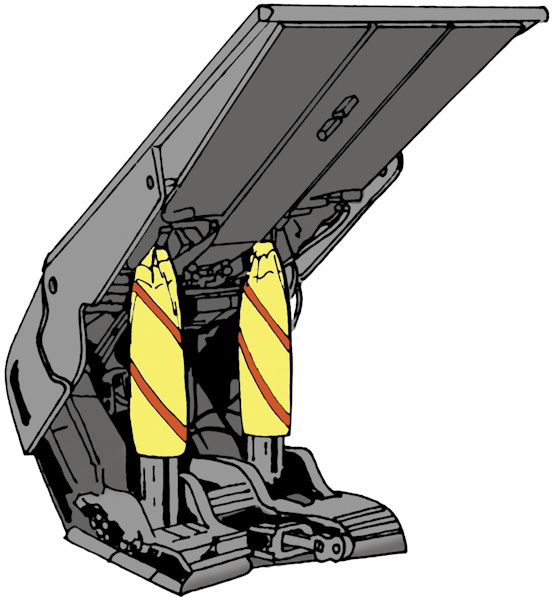 Provides strong, dry, high visibility storage for rock dust used for fire protection in mines. Made from nylon reinforced vinyl, which is tear resistant, durable and waterproof. Bright red-orange material resists mold, mildew, rotting and most chemicals. High visibility red-orange reflective bands for added safety. High quality features include folded and sewn seams to resist moisture and velcro tabs on front flap for fast access to rock dust. Large capacity bags have 2 heavy duty webbing handles for 1 or 2 man carry of rock dust. Clean, dry, high visibility storage for fire extinguishers used in mines. 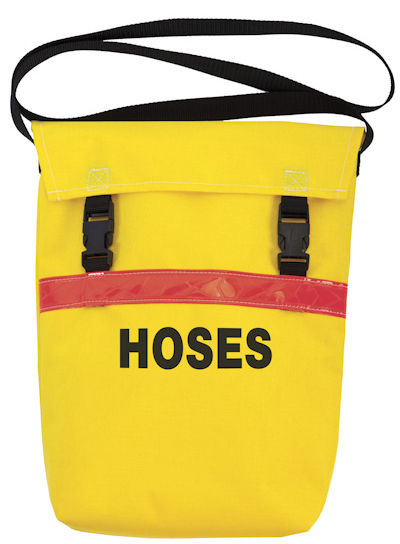 Bags help ensure extinguishers will be ready to operate in emergencies. Also helps keep inspection tags from being vandalized, lost or damaged. Made from strong laminated nylon with clear top dome for checking gauges and tags. 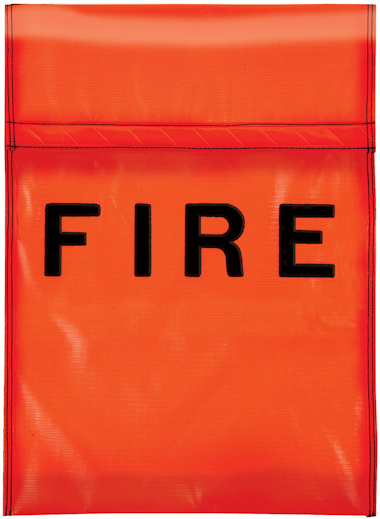 High visibility reflective band around entire bag provides faster identification of extinguisher. Bags can be hung anywhere with heavy duty webbing top loop. For added strength, webbing encircles entire bag. Sturdy webbing side handles make fire extinguisher easier to carry. Quick access is provided when handles are pulled apart to open velcro seal which runs along the entire right side of bag. High quality construction and materials. 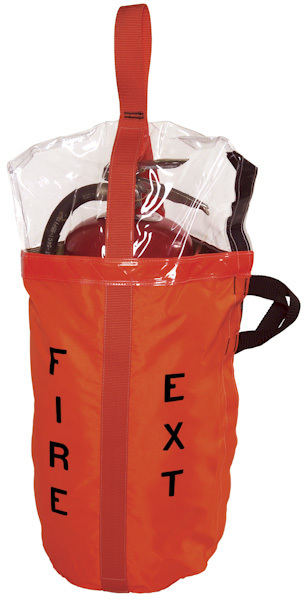 Slip-over and custom bags available for extinguishers up to 150 pounds (68.2kg). 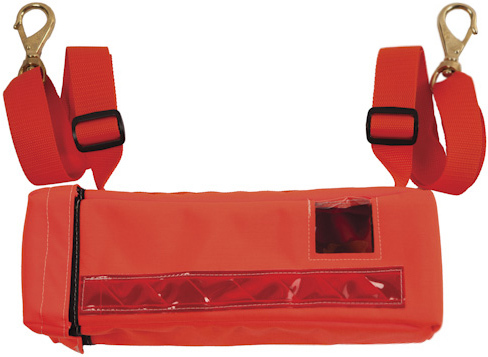 Designed to firmly and safely hold self rescuers on a miner’s belt. Made from heavy duty polypropylene webbing and brilliant reflexite material for improved visibility and safety. Can be custom made to fit any size self rescuer. Extra protection for self rescuers during transport and storage. Constructed with 2 layers of heavy duty 1000 denier cordura nylon and 1/2″ (13mm) thick foam core for extra padding and protection. The brilliant reflexite tape and fluorescent orange cordura greatly improves visibility. Windows allow for reading of gauges. Entire lid sealed with velcro. Sturdy 1-1/2″ (38mm) wide webbing straps with buckles for adjustment in both shoulder strap and back pack models. Variety of styles available. Can be custom made for any size rescuer. 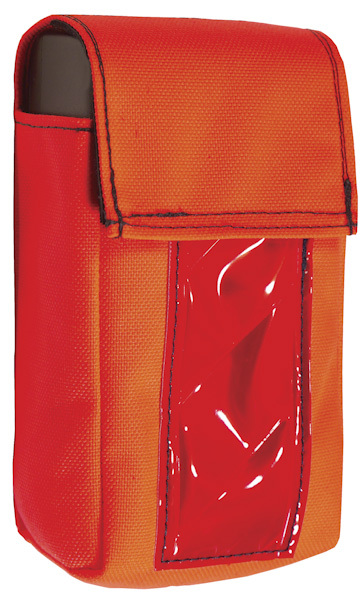 CAB offers a wide variety of durable, custom-made bags, pouches and holders in any size for many applications. High visibility features make them ideal for safe, secure storage of batteries, detectors, meters, gauges, tools, communication devices and other equipment. Made from a variety of heavy duty materials such as 1000 denier cordura nylon, brattice cloth and nylon reinforced vinyl. Colors may include high visibility orange, black, gray and lime yellow. 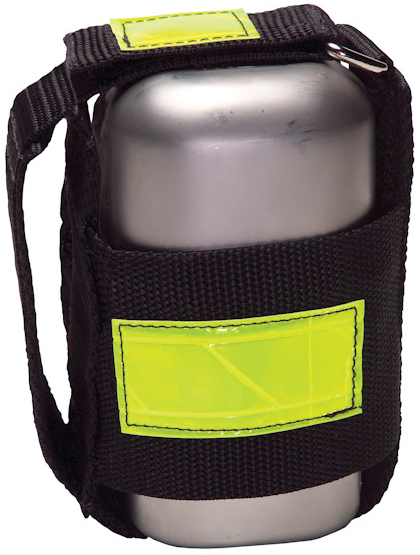 For added safety and protection, brilliant, high visibility reflective bands can be sewn on any bag. See chart below for the eleven reflective colors available. For added utility, CAB offers many custom features. These may include webbing for handles, shoulder straps, belt loops, back straps, and bag reinforcement. Other features are clear windows for reading gauges, foam padding for protecting contents, snaps for quick attachment, buckles for adjustment and custom lettering for fast and clear identification. Variety of closures are available including velcro, side-release buckles, zippers and snaps. Call for more info. High quality covers designed to protect longwall cylinders from constant exposure to dust, dirt and water. Made from heavy duty material with a strong velcro, zipper or snap closure along one side. CAB Gaitors are more cost effective than factory gaitors and are custom made in a wide variety of styles. Also available with reflective bands for improved safety. Provides brilliant reflective surface for identification and marking of pipe and cable. Covers are flexible, impact resistant and have a strong velcro closure for quick and easy installation. The 25′ (7.6m) covers can be installed on cable reels to alert machine operators that end of cable has been reached in shuttle cars, miners and roof bolters. All covers ordered by circumference of pipe or cable. Available in a variety of sizes up to 25′ (7.6m) long. Some minimums apply. CAB 515 Fits cable 3-3/4” to 4-1/2” (95-114mm) circumference, lime yellow, 25’ (7.6m) long. CAB 513 Fits cable 5-1/8” to 6” (130-152mm) circumference, lime yellow, 25’ (7.6m) long. CAB 516 Fits cable 3-3/4” to 4-1/2” (95-114mm) circumference, red orange, 25’ (7.6m) long. CAB 514 Fits cable 5-1/8” to 6” (130-152mm) circumference, red orange, 25’ (7.6m) long. √ True colors are reflected for improved safety in a complete color code identification system. √ Won’t impregnate with dust and dirt like other reflective material. √ Reflects at wider angles and greater distances for better visibility. √ Durable, impact resistant and exceptionally brilliant.